Corporate social responsibility codes are guidelines that companies voluntarily develop and publish with the objective of showing the public their commitment to respect human rights, to improve fundamental workplace standards worldwide and to protect the natural environment. These corporate codes have become a crucial element in the regulatory architecture for globally operating companies. By focusing on the characteristics of the codes, their effects on society and their legal consequences, this book seeks to provide a comprehensive analysis of corporate codes and the law. 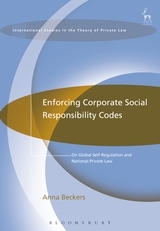 Enforcing Corporate Social Responsibility Codes develops proposals on the relationship between global corporate self-regulation and the national private law systems. It uses methods of comparative law and sociological jurisprudence to argue that national private law can, and in fact should, enforce these codes as genuine legal obligations. The author formulates legal policy recommendations for English and German private law that indicate how the proposed legal enforcement could be realised in practice. The dissertation on which this book is based was awarded the second prize in the humanities category of the Deutscher Studienpreis (German Thesis Award) by the Koerber Foundation in November 2015.
globalisation fields will certainly find the book useful. Anna Beckers is Assistant Professor of Private Law and Legal Methodology at Maastricht University.